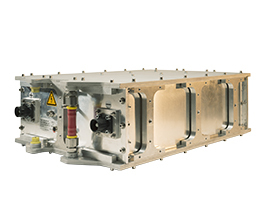 Complete systems with ultracapacitor modules and power electronics. The evolution of electricity supply, demand, efficiency and reliability is driving significant infrastructural and operational improvements of electrical grids worldwide. 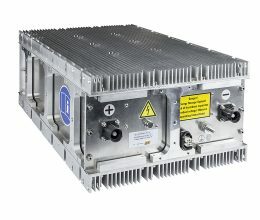 Ultracapacitor module for energy storage systems. 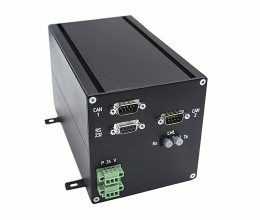 The Monitoring Control Unit (MCU) controls the ESS system. 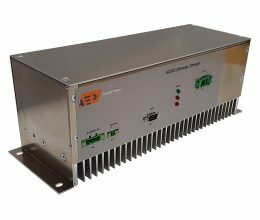 Bidirectional DC/DC or AC/DC converter for energy storage systems. 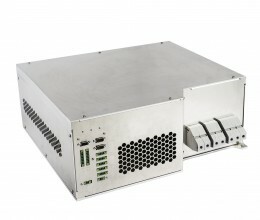 Waterproof, liquid cooled ultracapacitor module. 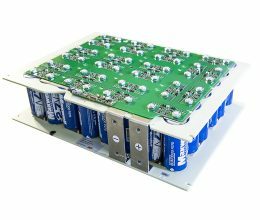 Our Energy Storage Systems are a combination of our ultracapacitor modules and our sophisticated power electronics. On one hand we supply all our products to our customers and the customer handles the implementation in their systems but we’re also specialized in the implementation by ourselves. 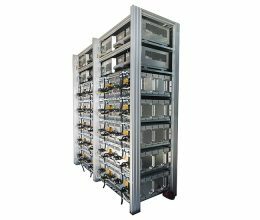 We make the calculation, the design, we’ll produce the modules and power electronics and we’ll do the commissioning if needed. 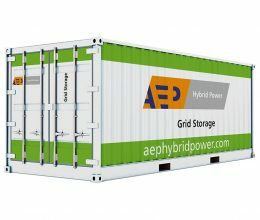 Below we’ll show some examples of the principals and a configuration in which we’ve added an Energy Storage system as a retrofit. 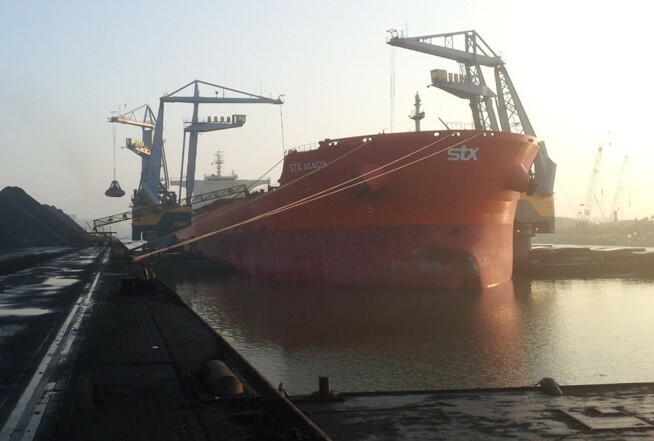 The figure below shows an overview of an installation we have in a floating crane. 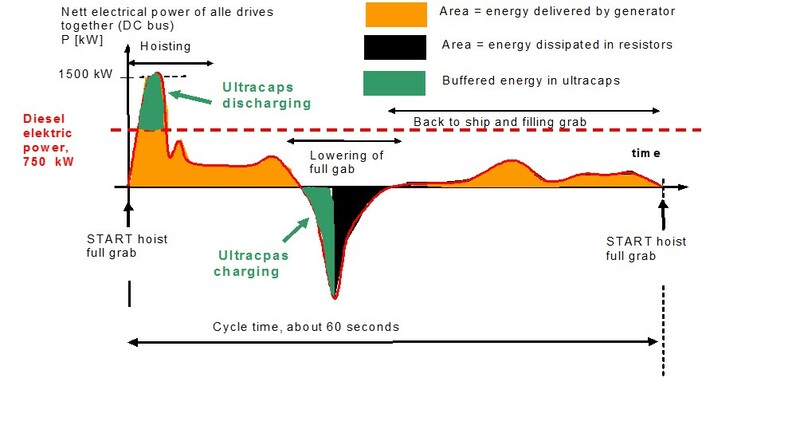 Everything that’s green is supplied or stored by the ultracapacitors. In this configuration we’ve set the generator on 750 kW, everything above will be supplied by the ultracapacitors thru our power electronics. 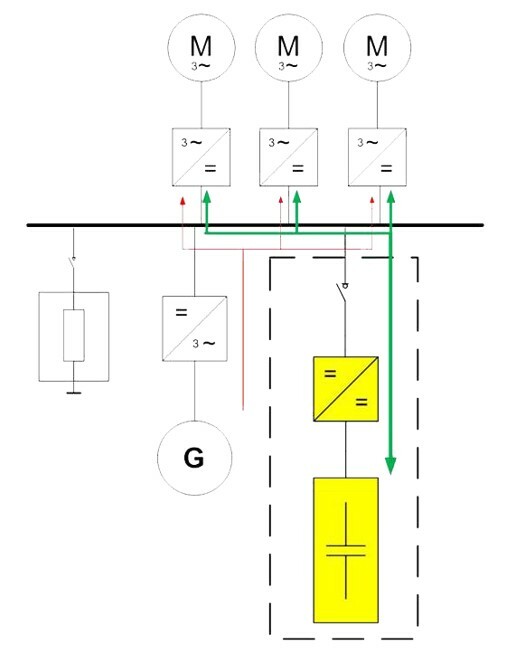 To store and/or supply more energy you’ll have to add more ultracapacitor modules, when you consider this we’ll make a calculation to see if this investment will be beneficial. This is a very sustainable solution but, of course, it’s also important to know how long it takes to earn the investment back. 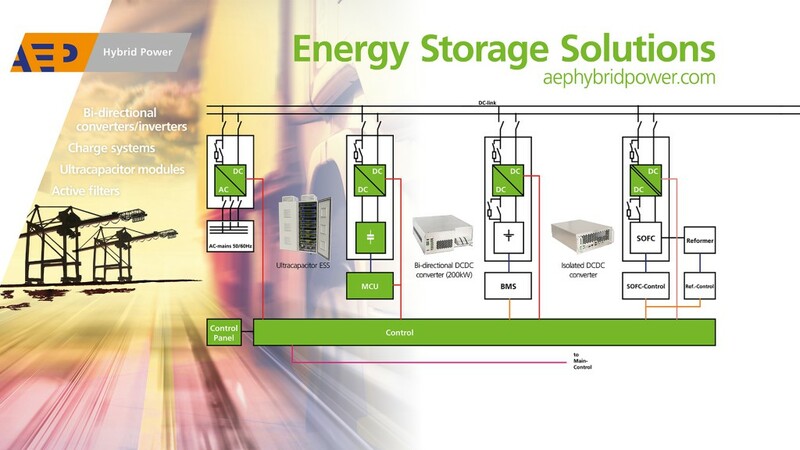 Below we’ll show how we implemented the Energy Storage System. It is an ‘add-on’ system, therefore perfect for a retrofit of your existing system. 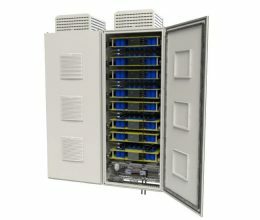 It’s, almost literally, just a connection to the DC-bus with our system and you’ll have an Energy Storage System which saves you a lot of money over the years and which makes your application very ‘environmental friendly’.